Refrigerator Repair Houston, TX 77090 specializes all types of refrigerators, whether it is french door refrigerator repair Houston, TX 77090, side by side Refrigerator repair Houston, TX 77090 we can help. If you have a refrigerator or refrigerator freezer that needs to be repaired or serviced in the Houston Area contact us, and let us know what you need. If your refrigerator is not cooling, or if your Refrigerator is leaking water, if your refrigerator is making a loud noise, maybe your Refrigerator won't make ice, we can help. My Appliance Repair Houston will have your refrigerator repaired or serviced in no time. We will have your refrigerator up in running in no time. At My Appliance Repair Houston, we charge you the lowest possible price for the repair of refrigerator. We don't charge for the service call if we perform the repair. In addition, we don't charge extra for holiday, weekend, or night appointments. Also, we provide repair estimates that have a low price guarantee policy protection. We also provide information about how you can extend the life of your refrigerator with every service call. We don't recommend that you perform repairs on refrigerator yourself. All refrigerator repairs need to be done by highly trained professional who have the proper tools to do the job correctly. In addition, repairs on electrical systems can be extremely dangerous for anyone trying to attempt a repair without the necessary experience and knowledge or experience. 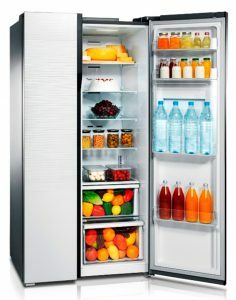 For professional, experienced refrigerator repair Houston, TX 77090 call My Appliance Repair Houston.